Running a city is a complicated team effort. There are libraries, parks, and a water system to manage. There are roadways to maintain, and parking to regulate. In Sonoma, there is also a city vineyard to run. 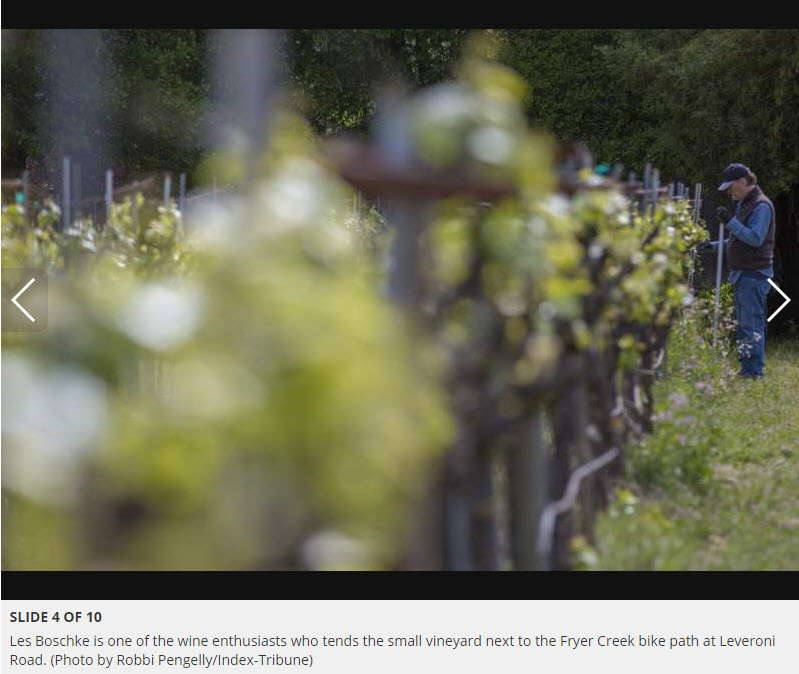 Located at 1395 Leveroni Road, the vineyard is planted on approximately 1 acre, and tended by amateur oenophiles who’ve been at it for decades. 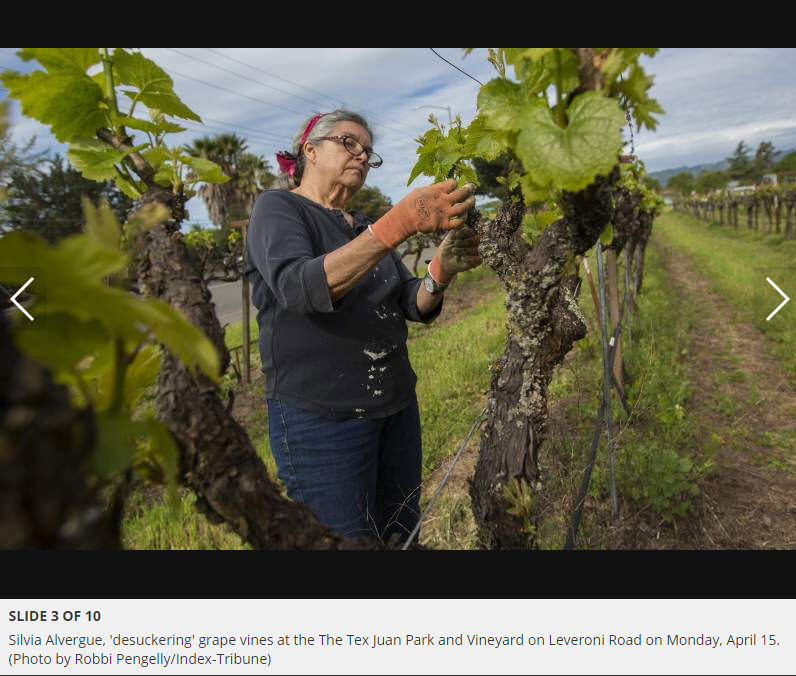 Ghiselin’s group, which refers to itself as the “Leveroni Group,” takes care of 21 rows of the vineyard, according to filmmaker Joseph Daniels, whose film, “Tiny Vineyards,” debuted at the Sonoma International Film Festival this year. “Sal’s Group,” led by Sal Troia, manages the remaining five. “The two groups are almost like friendly, rival grey-haired gangs with strong loyalties to their respective leaders, Doug and Sal,” Daniels said. There is pruning in January, followed by trellis repair. When the buds break in the spring, sulfur dust is sprayed to prevent mildew. Then comes harvest’s pick, crush, fermentation and racking. Just before summer, Ghiselin and his team bottle the unfiltered wine, about three barrels most years, or 72 cases. It was in 1997 that the city vineyard was officially adopted by the Valley of the Moon Dilettante Enological Society (VOMDES), which rebranded eventually as Sonoma Home Winemakers. 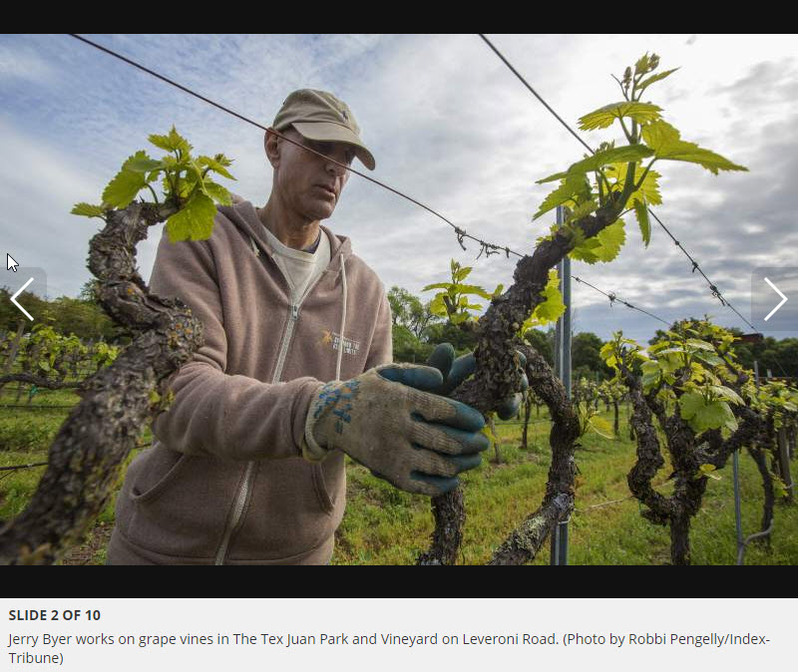 City leaders had approached club president Tex Juen, a well-known old-timer, and asked whether he would take responsibility for the vineyard’s management. “It was an old vineyard then, left to go to seed,” Ghiselin said. Juen got Joey Leveroni to donate 400 chardonnay vines, and the Kundes to give 400 merlot. The Sangiacomo family donated irrigation materials, and the city brought in a water tanker every Saturday. 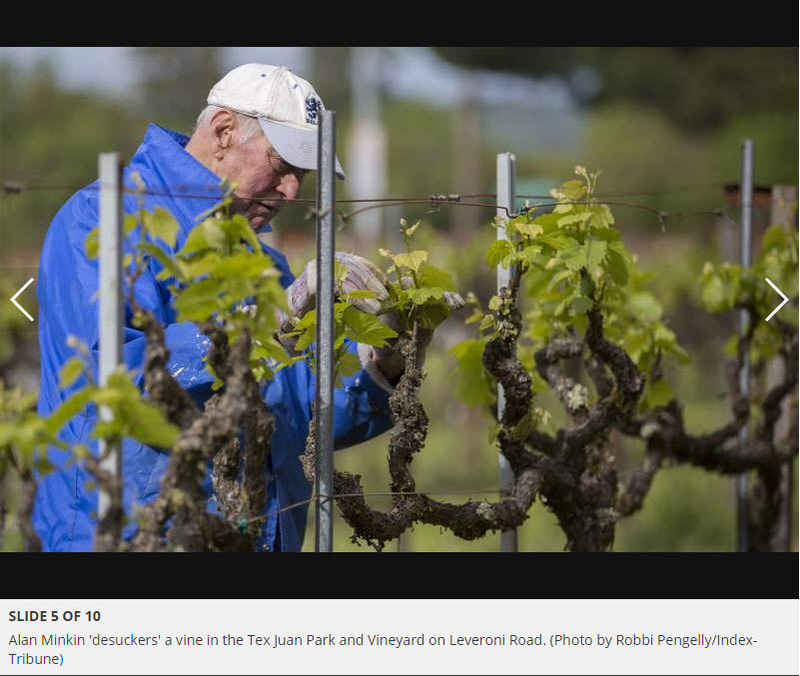 In 2002, when Tex Juen died, the club asked the Sonoma City Council to officially name the vineyard for him. 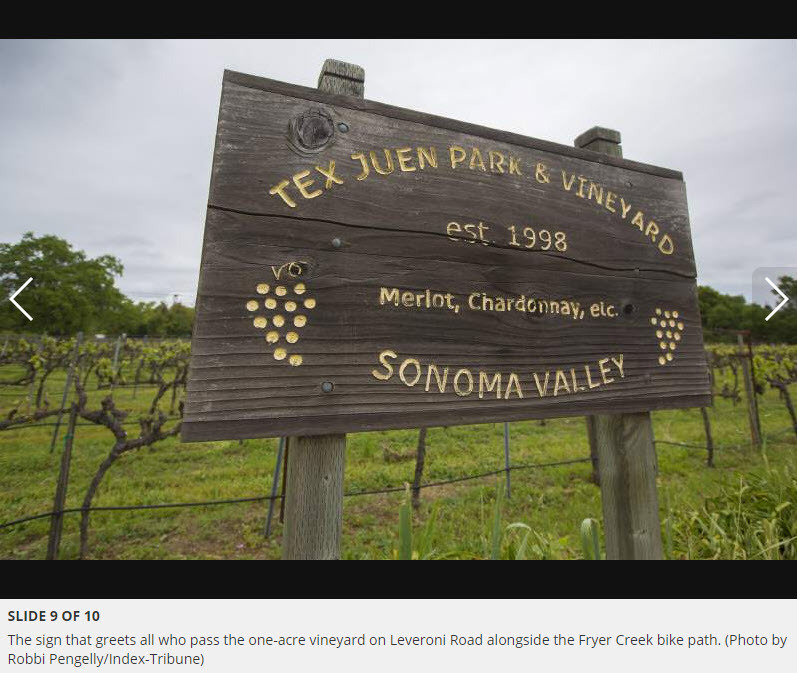 Tex Juen Park and Vineyard, leased through 2026 with two five-year extensions possible, is now a special part of Sonoma’s history. 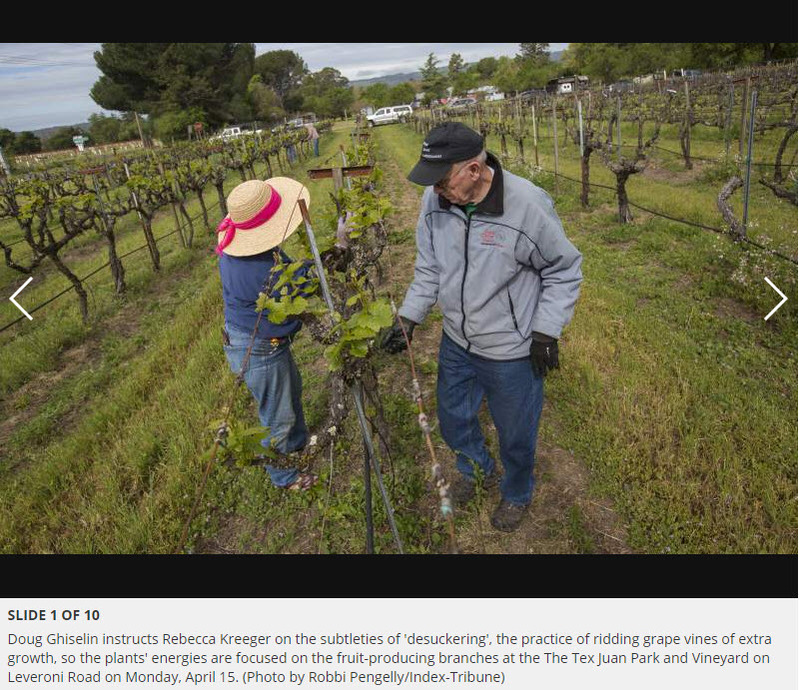 “The city appreciates the stewardship of the Sonoma Home Winemakers to maintain and preserve this special vineyard park. 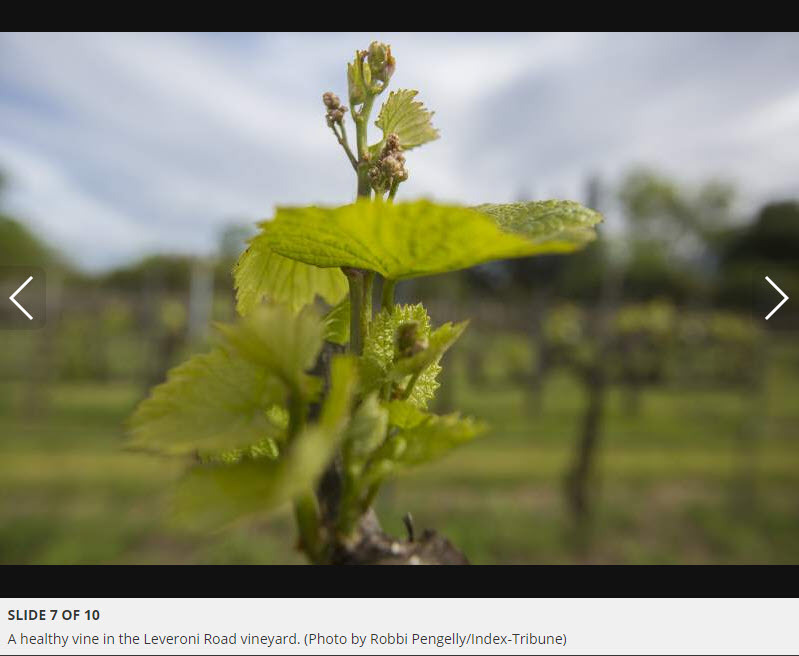 The winemakers provide a demonstration vineyard, and produce wine off site which is donated to local nonprofits for fundraising purposes,” city manager Cathy Capriola said. A fair quantity is consumed by its makers, as well. There are nine men and one woman in the “Leveroni Group,” and their average age is about 70, according to Ghiselin. A year’s harvest of three barrels into 72 cases — or 864 bottles — comes out to 86 bottles of wine for everyone in the group. Sometimes it’s good. Sometimes it’s not. 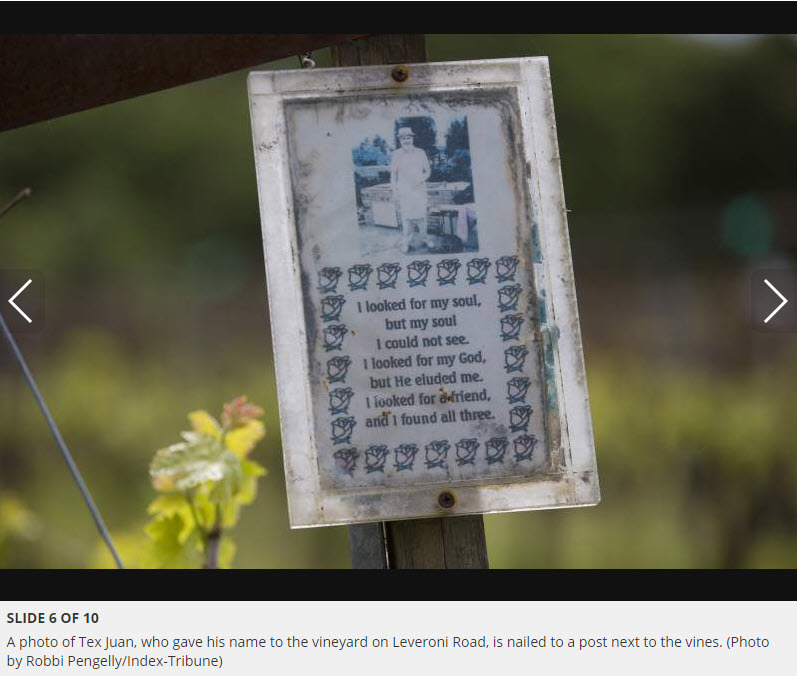 All the home winemakers tending Tex Juen create special labels for the bottles they keep. Ghiselin’s label reads “Mt. Pisgah Cellars” for the little knoll behind his house marked on geographical maps. When the vineyard’s current lease with the city expires in 2026, Ghiselin will be 85. When the pair of five-year extensions lapse in 2036, Ghiselin will be 95. Without fresh recruits, the vineyard could languish. Ghiselin’s take is not quite as romantic. He is not a man prone to hyperbole. 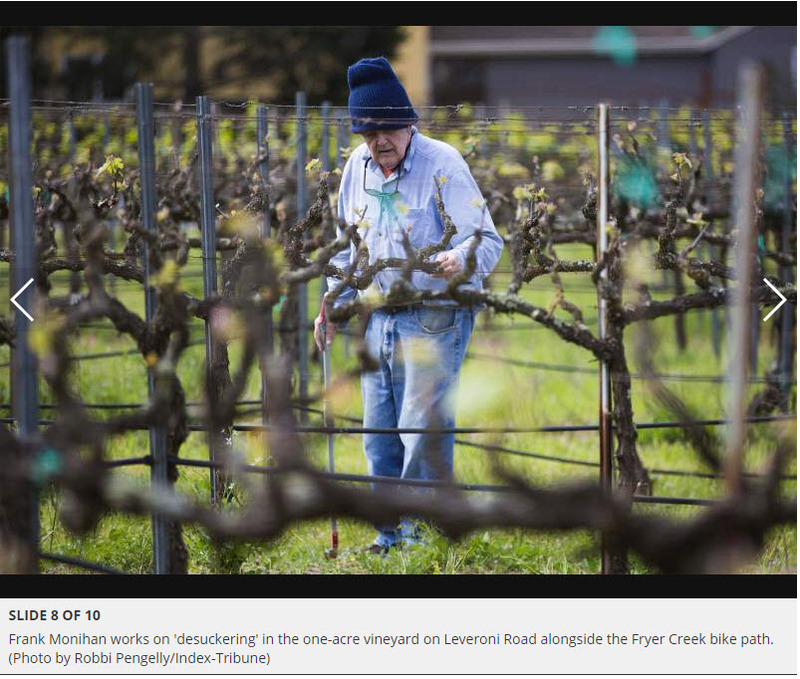 “It’s a nice looking well-maintained vineyard now. We cut the weeds four or five times a year,” he said with some pride. His cohort of aging enologists will keep on until they can’t, wringing every drop of potential from the vineyard’s terroir. It is a pleasure and a distraction and a way to contribute, but in the end it’s just wine, after all.